Looking for more books to read? Please visit my Book Promotions page and explore all the latest releases. Extracts, blurbs, reviews, author info, books links- all waiting for you! Is magick real? It must be because Author CeCe Osgood certainly has the potion for creating potent spells, I mean books! I was bewitched by the delightful heroine Abby Little in the first book of the series, Doomed by Desserts. I eagerly followed her adventures in the second book, and now we have the fun of the third book in the series. Abby learned she was a witch, or specifically a beginner Enchanter in the first book. She, and her teenage daughter Jill, left their small bakery and moved to Moon Water, Oregon in the second book. Moon Water is not the typical mountain town because some of the friendly town folk are also Enchanters. What’s it like being a novice Enchanter? Well, Abby has her own familiar, Busby. He first revealed himself to Abby as a book, but now he appears as a cat. He can talk, he has a pushy personality and he tries to help Abby learn the ropes so she can advance through the Enchanter levels. Abby also is learning to drive her own broomstick, and she enjoys zooming through the night sky under the stars. Then one day, out for an early morning bird walk, Abby and her neighbor find a body. Abby meets with the handsome sheriff and decides the death was accidental. But was it? Abby learns that several people in town could be suspects. Then things get even worse when the magickal world gets involved. Is Dim Fever spreading through Moon Water? Who are the Dark Flyers? Will Abby find the right hex, potion, or solution? I know you will enjoy this entertaining mystery with its fun characters, charming bits of magick and Author Osgood’s humor. Being an eternal child is wonderful. Grasping for Grace is the fourth book in the highly readable and fascinating Sunshine State series. This is one of my favorite series and I always look forward to the latest book! I love how the titles refer to the story, as well as positive life traits. These weren’t my favorite characters. I found them odd and disquieting. Which is just my take. For sure, book characters should be out of the ordinary. Who wants to read about regular people just emptying the dishwasher? Allison and Jay are certainly not average or boring. And you may well be delighted with their mercurial lives. This time, we get to know Allison, the man-hating psychologist. And we meet Jay. Jay is beyond handsome, an athlete with a great body who created his own successful fitness business. He oozes charisma, has a child-like love of life and many secrets. Could they ever be a couple? I wasn’t as comfortable with other parts of the plot. Jay and Allison’s relationship careened from one catastrophe to another as they both attempted to sort out their past lives. I realize it’s just fiction and I found it an exciting read, but some of their decisions were …insane? I received an ARC, and this is my honest review. Wow – we are so lucky to have you, Jena. I don’t know how you find time to read all these wonderful books. Many thanks for all the recommendations. Jena, three terrific reviews – you capture the spirit of the books immediately, drawing the reader in. 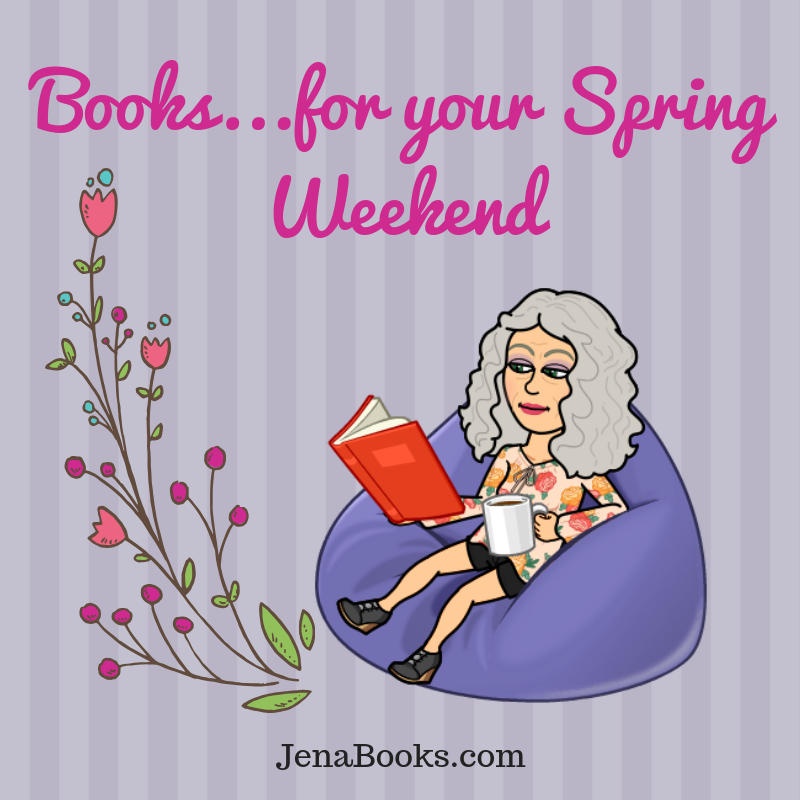 I’m off for an Easter break this week and have been looking for something new to read – you’ve given me lots of ideas here. Thank you so much for sharing these! Annika- thanks for the positive feedback- I’m grinning. Have a lovely Easter break! Enjoy your reading time. Which reminds me– how are you doing with your book list from all the different time periods?